This is Jennifer Worth's third and final installment of her Midwife series. With advances in medicine, societal and industrial changes, old housing condemned and new housing being built, the face of London's East End altered dramatically and the necessity for the midwives and nuns of Nonnatus House began to wane. 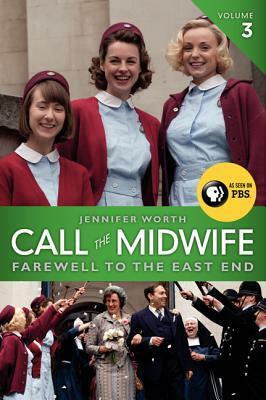 As with the other two books, The Midwife: A Memoir of Birth, Joy, and Hard Times and Shadows of the Workhouse, most of the stories in Farewell to the East End have already been featured as part of the PBS television series, Call the Midwife. Interestingly, there were more differences I noted between the stories as Ms. Worth told them in this book and the stories as they were portrayed on TV, than in previous books. And, as with the other books, Ms. Worth tackles hard topics in this one: "lost" babies, abortion, widespread death of children from tuberculosis, and spousal abuse, to name a few. Jennifer Worth had come from a solidly middle-class background. Her experiences as a midwife in London's East End opened her eyes to a world she had not known existed except, perhaps, in theory, and living and working with the nuns opened her heart to faith. Her years at Nonnatus House were a "spiritual journey" and she acknowledges that "I owe to the Sisters more than I could possibly repay...The words 'if God really does exist, then that must have implications for the whole of life.'" While she served the people of Poplar, her soul was fed as well. Her admiration for the nuns is palpable. "The nuns generated adventure. They plunged headlong into anything, fearlessly: unlit streets and courtyards, dark, sinister stairways, the docks, brothels; they would tackle rogue landlords, abusive parents - nothing was outside their scope." She continues, "We took our lead from the Sisters, and feared nothing...My colleagues and I loved every minute of it." This series is ostensibly about mid-century nursing and midwifery in London, and it provides a fascinating and intimate view into a world that no longer exists. But it is also about transformation and shifting perspectives, about a young woman's growing appreciation for the way others live - and die. "Life is made of happiness and tragedy in equal proportions," she says. "A life's work fulfilled and finished is a triumph."